FEMA today announced that private nonprofit houses of worship are eligible for disaster assistance as community centers without regard to their secular or religious nature. These changes are effective for disasters declared on or after August 23, 2017 and for applications for assistance that were pending with FEMA as of August 23, 2017, including applications on first- or second-level appeal, that as of today have not yet been resolved by FEMA. Under the Robert T. Stafford Disaster Relief and Emergency Assistance Act (Stafford Act), FEMA provides financial assistance, through its Public Assistance Program, to certain private nonprofit (PNP) organizations for the repair or replacement of facilities damaged or destroyed by a major disaster. FEMA’s changes now make houses of worship owned or operated by PNP organizations eligible applicants for this financial assistance (1) if their facilities suffered damage from an event declared a major disaster on or after August 23, 2017, or (2) if they had applications pending with FEMA as of August 23, 2017 that, as of today, have not yet been resolved by FEMA. As with other non-critical PNPs under the Stafford Act, FEMA financial assistance for the repair or replacement of a PNP house of worship facility is limited to costs that a loan from the U.S. Small Business Administration (SBA) will not cover. PNP houses of worship must apply to the SBA for a loan, as required by the Stafford Act. FEMA will provide financial assistance if the PNP house of worship is denied a loan or if the loan authorized is insufficient to cover repair costs. This change will be reflected in the third edition of the Public Assistance Program Policy Guide, which will be available online at www.fema.gov/media-library/assets/documents/111781. FEMA announced that the annual funding opportunity for the Fiscal Year 2017 Assistance to Firefighters Grant Program (AFG) is now open, and the application period will close on Friday, February 2, 2018 at 5 p.m. (Eastern). The Fiscal Year 2017 AFG program will award $310.5 million to enhance the safety of the public and firefighters against fire-related deaths and hazards. FEMA awards AFG funding to fire departments, nonaffiliated emergency medical services organizations, and state fire-training academies. In addition, FEMA awards funding to other nonprofit organizations recognized for their experience and expertise with respect to fire prevention, fire safety programs and activities, or firefighter research and development programs. Since 2002, FEMA has awarded $7.1 billion in fire grants. Historically, 84 percent of awards go towards purchasing personal protective equipment, vehicles and other operational equipment. Applicant tools, including the AFG Notice of Funding Opportunity, for this program will be available at www.grants.gov and at www.fema.gov/welcome-assistance-firefighters-grant-program. Further, the “Get Ready Guide” may also be useful for potential applicants and is provided to answer questions and to help prepare grant applications. For fire departments/applicants requiring assistance please visit www.fema.gov/grants, or contact the AFG Help Desk at firegrants@fema.gov or 1-866-274-0960. FEMA’s Emergency Management Institute (EMI) is hosting a series of “One Link, One Bridge, Many Voices” e-Forums every Wednesday from 3-4 p.m. Eastern Time (ET). EMI e-Forums are one-hour, moderated webinar discussions that provide an opportunity for EMI and the emergency management community to discuss matters of interest on national preparedness training. The e-Forums showcase whole community partners and peers, sharing their experiences. The panel format offers opportunities to provide technical assistance in training management by facilitating peer-to-peer sharing of best practices. EMI e-Forums on Adobe Connect are mobile device accessible. The National Weather Service (NWS) issues outlooks, watches, warnings, and advisories for all winter weather hazards. Here’s what they mean and what to do. Use the information below to make an informed decision on your risk and what actions to take. - Winter Storm Watch: Be Prepared. A watch means that severe winter conditions may affect your area. NWS issues a watch to provide 12 to 36 hours notice. - Winter Storm Warning: Take Action! NWS issues a warning when it forecasts four or more inches of snow or sleet in the next 12 hours, six or more inches in 24 hours, or 1/4 inch or more of ice accumulation. Travel will become difficult. Delay your travel plans until conditions improve. - Winter Weather Advisory: Be Aware. An advisory informs you that winter weather may produce hazardous conditions. - Blizzard Warning lets you know that snow and strong winds will combine to produce a blinding snow (near zero visibility), deep drifts, and life-threatening wind chill. 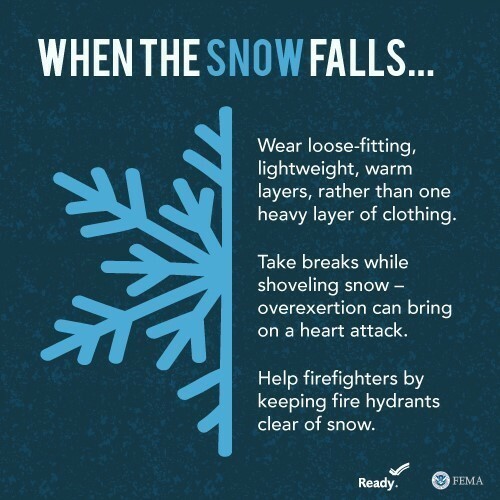 Listen to your local officials for the latest information, and visit www.ready.gov/winter-weather to learn more about preparing for snowstorms and extreme cold.